S/11071 Private J.A. 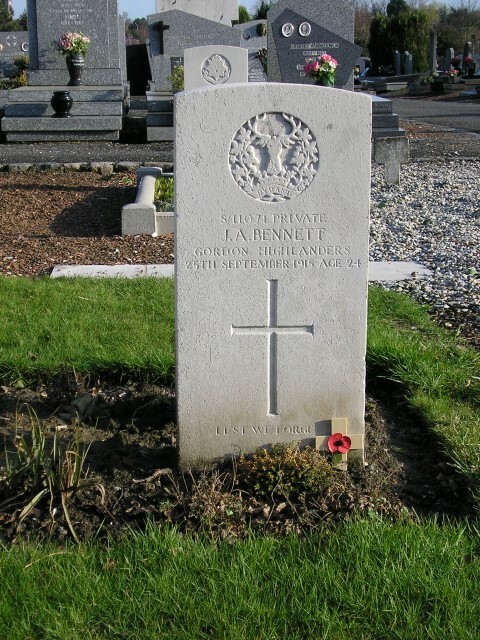 Bennett, 1st Battalion, the Gordon Highlanders was killed in action 25 September 1915 and is buried at Halluin Communal Cemetery, France. He was 24 years old and is commemorated on the Butterknowle War Memorial and the memorial plaque in St. John the Evangelist Church, Lynesack. In 1901 the family lived at 3 Hubert Terrace, Gateshead. By 1911, 19 year old James lived at Thorpe Moor House, Castle Eden with the Dean family and worked as a farm labourer. James enlisted at Barnard Castle  so presumably, by then he’d moved over to the Gaunless Valley area and found work on a farm in the Butterknowle locality. CWGC records that Mrs. B. Arkless provided details for his epitaph. A branch of the Arkless family lived in the Evenwood area to the east of Butterknowle and perhaps a family connection was responsible for J.A. Bennett finding work. The battalion took heavy casualties at Le Cateau, 26 August 1914 and it saw further action throughout 1914 at the Battles of the Marne, Aisne, La Bassee and Messines and then the Battle of Ypres. In 1915, it was involved in the Winter Operations of 1914-15, the First Attack on Bellewaarde, the Actions at Hooge, 19 July and then the Second Attack on Bellewaarde, 25-26 September 1915. 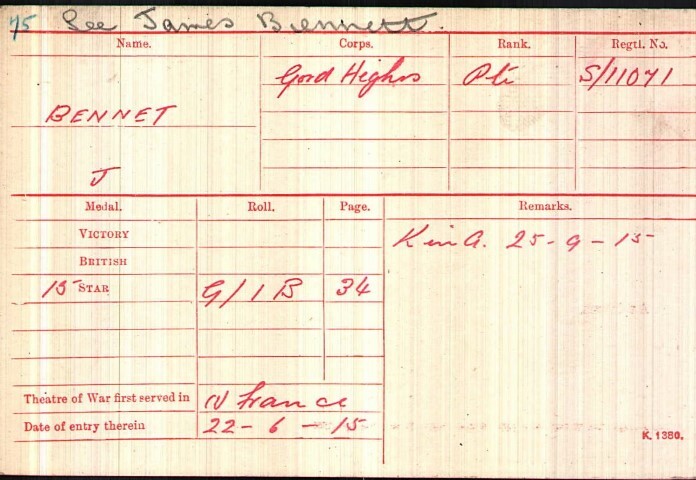 Private J Bennett entered France 22 June 1915  joining the battalion as a draft. He was killed in action 25 September 1915, this being the date of the commencement of the Battle of Loos. The battalion did not take part in the main show but subsidiary action in support, the Second Attack on Bellewaarde, to the north near Ypres. Later research records that there between 25 and 30 September 1915, 1/Gordon Highlanders suffered 3 officers and 94 other ranks killed in action or died of wounds. 2 officers and 84 other ranks including Private J.A. 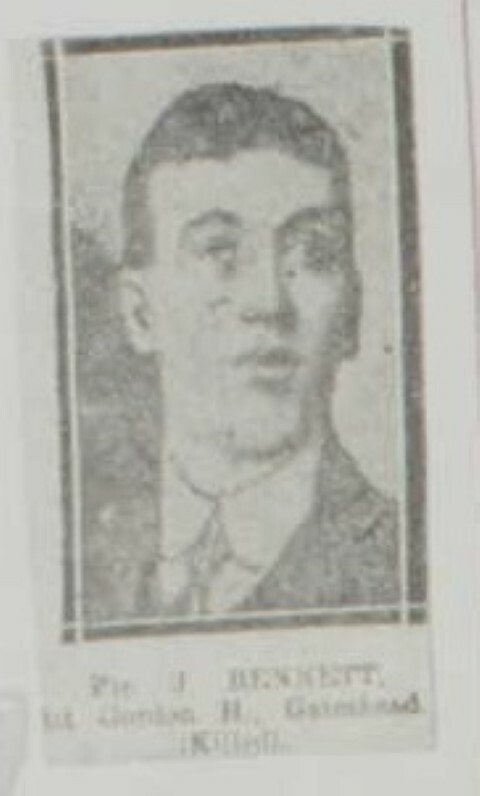 Bennett were killed in action 25 September 1915. Private J.A. Bennett is buried at grave reference C.10. Halluin Communal Cemetery. Halluin is an industrial town in the Department of Nord, France to the south of Menin, which is across the river Lys in Belgium. There are 35 burials of Commonwealth servicemen. He was originally buried at plot J.3 and his date of death was given as 27 September 1915. Graves were regrouped and he was buried at plot C.10. Schedule A indicates that he died 25 September 1915. Service Record compiled by Paul Simpson (microfilm 1386)) & SDGW –this source records that he was in the 1st Battalion. The CWGC certificate records him to be in the 16th Battalion but on further examination, it is confirmed that he served with the 1st, possibly D Company. Army Form W.3372 and revised certified report. CWGC Note: Service Details record that Mrs. Annie Arkless, 3 Castle Place, Bensham Road, Gateshead his sister received his possessions. 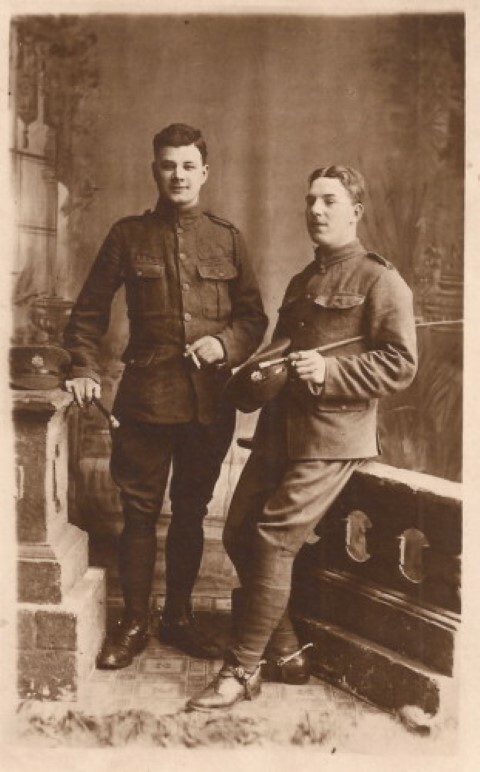 His medals were received by Mr. John Bennett, 40 Ridley St., Stanley his father.